How comfortable are you leaving your success up to chance? How good a business strategy is waiting to get lucky? If you say, “Not very” to both questions, you’re in good company. While women and men who enjoy great success in business have many traits in common, “luck” is not one of them. That’s good news, because it means that, if you’re an entrepreneur still building your business, you don’t have to fret about whether “chance” or “luck” will smile on you and favor you with success. Successful business builders don’t rely on luck, but they do exhibit several traits that predispose them to success – and you can develop those same traits if you don’t already have them. Can you say, “Woohoo!”? Trait #1: They know why they’re doing what they’re doing. German philosopher Friedrich Nietzsche once observed, “He who has a Why to live can bear almost any How.” If you don’t have a compelling Why, you’re likely to be derailed by the challenges inherent in the Hows. That’s why it’s so important to dig deep for why you’re in business. To make a lot of money? Pffttt. To help people? Yawn. Dig deeper. What experiences will that money enable you to enjoy? How are you nourished by helping people? How will building this business give meaning to your life? There are two compelling videos I strongly encourage you to watch if you’re not 100% clear on your Why. Simon Sinek’s TED talk, “Start With Why”, makes a great case for getting clear on your Why, and he eloquently explains the benefits, both financial and emotional, of doing so. This is 18 minutes well spent. The other video, which will hit you right in your gut, is about chef-turned-social-worker Narayanan Krishnan. In just 2 minutes and 40 seconds, he explains how he found real meaning in his life – right in his home town. To super-charge your life satisfaction as well as your worldly results, know your Why. Trait #2: They make it all about the customer. Yes, yes, we’ve heard it a thousand times before – the customer is both queen and king. We even came up with a rather contrived word for this viewpoint: customer-centric. But how many of us spend time thinking about creating a customer experience that’s seamlessly fabulous, from the very first interaction to the way they sing our praises on their social media channels? Business owners who create that kind of experience are unfortunately rate, as I know from painful personal experience. My husband and I moved to Cedar Rapids, Iowa, a little over three years ago, and we’re still looking for service providers who can do good work on our 101-year-old house. We’ve had mixed results in our search. For example, we’re madly in love with our best buddies at Colony Heating and Air Conditioning. Why? Let’s see…. Perhaps these business owners are independently wealthy and are only “in business” as a hobby. Trait #3: Successful entrepreneurs are bold and daring (in a calculated kind of way). Have you noticed how many times these sayings play out in real life? Decisiveness, courage, and a willing to take calculated risks seem to be key in achieving success, no matter the field of endeavor. The trick, of course, is to find that fine line between risk tolerance and stupidity. When you’re clear, you’re much more likely to be smart in your risk-taking. This clarity applies to your vision for the business, knowledge of how your own strengths provide value to clients, and what skills you currently lack to create the outcome you want. If you’re able to cold-bloodedly evaluate your desired outcomes, resources, and gaps, you’ll be in a much better position to say “no” to fabulous shiny objects that don’t serve you, and “yes” to investments that are likely to pay off for you. Here’s a case in point: A colleague of mine considered her greatest skills, her ideal client, and ways she could use her skills to solve those clients’ pressing needs. She identified a type of program that would allow her to operate in her sweet spot to provide massive value to clients. She was honest enough to also know she needed some guidance in creating this program. Because she was so clear on what she wanted to create and whose guidance she wanted in creating it, she had the courage to invest several thousand dollars in a mentoring program that is going to fill in the gaps in her knowledge and enable her to launch a hugely successful program. Is this sort of big decision easy or comfortable? Almost never. Is it easier to make when you approach it strategically and courageously? Absolutely. And more often than not, you’ll be glad you did. Either you’ll achieve the outcomes you wanted, or you’ll learn valuable lessons to make your next venture more successful. Are you feeling “lucky”? Do you demonstrate some or all of these traits in your own business? In that case, it’s time for a happy dance. Or are you realizing that there’s definitely room for improvement here, if only you could figure out where to start? If that’s the case, I have some ideas. My focus is working with entrepreneurs who, despite being really good at what they do, often get such mediocre results that they feel inadequate, phony, and sometimes even desperate. I show them how to get out of their own way, clarify what needs doing and why, and hold them accountable for taking the action steps needed. Can I do this for you? Probably; the question is whether that would benefit both of us. The only way to tell if we’re a good fit for each other is to spend some time getting acquainted through a no-charge, no-risk phone call. It’s easy to set up; just grab a spot on my calendar, we’ll ask and answer some questions, and we’ll both be confident that our decision about working together – whether yes, no, or later – is the right one for both of us. 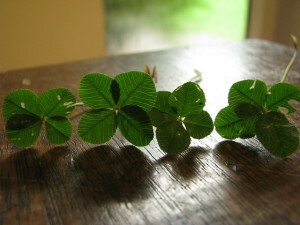 Thanks to Seattleye for posting the image of the four-leaf clovers in the Creative Commons section of Flickr. This entry was posted in marketing, personal power and tagged effectiveness. Bookmark the permalink. One Response to Do you share these traits with the world’s luckiest entrepreneurs?